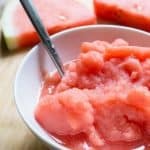 A refreshing and light frozen treat! Start on low then turn up to high power and blend until smooth. If your blender is having trouble blending, add more fresh watermelon chunks. You might end up with more of a slurpee texture, but it will be equally delicious!